"Fancy words and old ways don't cut it now. We need something with a fresh nip to it." From the blistering open credits, the heat is palpable. A teenage boy peers out into the night air, opening his Evinrude outboard to full throttle. The boat screams forward. The churning foam of the ocean reflects the turmoil boiling within; this is a man on a mission, not a child looking desperately for a way home. A fiery gaze pierces the darkness over the water. The object of his search is a mystery, but judging from the intensity added by the camera's slow zoom, one does not want to be on the receiving end of this youngster's rage. This is Haruji (Masahiko Tsugawa), a new inductee to the Sun Tribe, a group of coastal misfits who pass their time drinking, sleeping, gambling, and enjoying women. It is a nihilistic existence, complete with well-pressed tropical shirts, bathing trunks, and a few cigarettes for good measure. Gone are the antiquated concerns of family honor, loyalty, and responsibility. Hedonism is the tone now, and living for the moment is all that matters. Haruji seems too innocent for such sin, and his elder, more experienced brother Natsuhisa (Yujiro Ishihara) agrees. When the dynamic duo spots a fetching young girl at the local train station, Haruji is smitten. Natsuhisa teases the youngster; poor Haruji has no idea what he's getting into. During another endless round of water skiing and boating, the brothers see a mermaid in the distance. It is Eri (Mie Kitahara), the girl from the station. What luck! Haruji seizes the opportunity to become acquainted, and the two become fast sweethearts. Unbeknowst to the naive boy, Eri's image is far from squeaky clean. After noticing her mysterious ways, including a night out with a strange foreigner, Haruji becomes suspicious, but his brother is wise to the situation. Natsuhisa knows Eri better than his brother ever will. The death of a dream is only a speedboat away, and the strains of love begin to sound more like the call of a siren, with all the dangerous trappings therein. 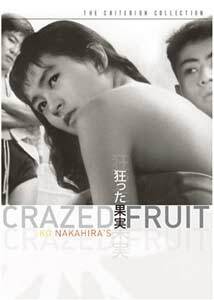 Like Kurosawa's Stray Dog, Ko Nakahira's seminal Crazed Fruit is an unforgiving examination of Japan's postwar identity crisis, bathed in the sweltering heat of summer. Though Haruji's quest is far removed from the self-atoning exploits of Mifune's rookie cop, the momentum is similar. A desire to deliver justice is replaced by buckets of raging hormones; these boys are on a collision course with their own misguided notions, propelled at the speed of a roaring outboard motor. A groundbreaking taiyozoku (Sun Tribe) film, Crazed Fruit infuriated conservative members of Japanese society, many of which condemned the film for its lurid content and blatant disregard for the traditions of old. On the contrary, Nakahira is an honest, honorable filmmaker, readily pointing out the dangers inherent in such a nihilistic existence. This is a picture with a firm moral that slams home by the end credits. LLikewise, Nakahira's honesty extends into his frank, realistic account of first love. All the nuances, awkwardness and passionate discovery is here, captured with a keen eye for detail; a subtle gesture, a passing glance, and a brief touch are all that is needed to deliver the message. Frequently, these amorous scenes wonderfully transform into silent cinema; words are not needed for such universal moments. Sweetness aside, this is a raging film that delves into the postwar transformation with a kind of energy and candor found in the snappy nightclub passages of a Scorsese picture. It is a fascinating examination of a Japanese sub-culture, one that many felt was more a product of fictional pulp novels than a postwar renaissance. The three leads are perfectly at home in these environments, delivering achingly honest and only occasionally awkward performances. There is a kind of unstoppable momentum to this film, which flows along effortlessly through some keen editing, such as an early barrage of close-ups that reveal the youths' simple philosophy. A sultry, twangy score by Toru Takemitsu and Kurosawa vet Masaru Sato completes the affair�certainly more Hawaii 5-0 than Noh. These devices further the inevitable pull of the plot's undertow; a threat that lurks just beneath the surface, but Haruji and his cohorts are already in over their heads. Image Transfer Review: Criterion's black-and-white 1.33:1 transfer is superb. Japanese films from this era tend to look a bit rough; indeed, there is some fine grain that persists from time to time, but this remains a rather clean, solid transfer with good detail and excellent contrast. Audio Transfer Review: The Japanese monaural audio is bright and clear, and only slightly hissy. Extras Review: Always a pleasant listen, Japanese film scholar Donald Richie offers another commentary. This is a track full of the historical details and skilled observations that have made Richie's comments stand out in the past. A fine addition. The only other extra is a theatrical trailer, and an insert containing new, informative essays by Chuck Stephens and Michael Raine. Criterion brings another gem to our attention. Ko Nakahira's groundbreaking taiyozoku film blisters with the heat of desire, and the energy of youth. It's an astute examination of Japan's postwar turmoil, screaming along at deathly speeds.